Cunard is earlier than the standard for pecans, the Stuart pecan, but it is not as early as Pawnee or Byrd. Because of its early maturity, it should not be planted with late-maturing cultivars. The nut size is similar to Morrell and Desirable and larger than Stuart, Pawnee, Byrd and Cape Fear. The nut size of less than 45 nuts per pound means Cunard is highly suitable to the profitable “Mammoth Half” trade. 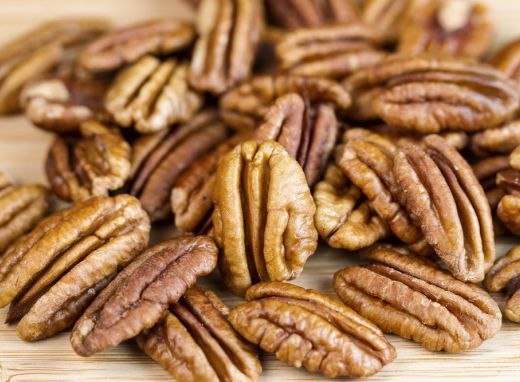 The percentage kernel of Cunard is 60.3%, which is exceptionally good for pecans; Cunard’s production is higher than Cape Fear (51.6%). Cunard should not be planted unless the grower plans to control fruit load by thinning. Production was about 2.7 times greater than Cape Fear during the fifth year after planting and about five times greater during the sixth year. Cunard will require fruit thinning and is well-suited to the mechanical process. Cunard is not susceptible to insect and disease problems and is highly resistant to scab disease. It does not have the speckling problem of Pawnee.